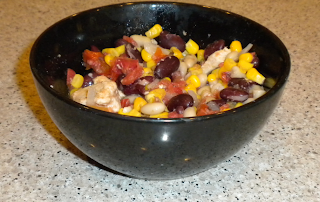 So, in the vein of delicious, easy meals in a bowl, I thought I'd offer up one of the easiest chilis I have ever made and thoroughly enjoyed. This is a high protein, low fat, energy boosting, quick-fix meal. Enjoy! Heat the oil in the bottom of a stock pot and cook the onion and garlic until the onions are soft and the garlic is browned (about 3 minutes). Add the chicken broth and the fire-roasted tomatoes; stir. Add the chicken and cook on medium high for 8-10 minutes, until chicken is cooked all the way through. 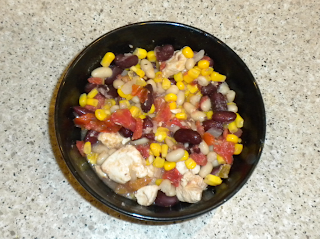 Next, add the beans and corn. Add lime juice (I used about 1 tbsp, but I'd recommend adding 1 tsp at a time until you're happy with the taste). Simmer for 5 minutes. Salt and pepper, to taste. Simmer for another five minutes and serve hot. To store, pour the chili through a colander to drain it and then put it in a sealed tupperware container. It will keep for about a week. Deliciously!